A legal immigrant who came to America many years ago from Lebanon that still resides in California shared back in 2018, why he left his own country which was because of lax border security, constant incursions by dangerous militants and others who robbed him and also his neighbors. Then he went on to say the following after he had moved to California. So, there it is in a nutshell. This testimony, starkly reminds us of the chaos that is presently happening in much of Europe and those countries that are part of the European Union. Because of the delicate balance of multiculturalism and Immigration, it must be done in such a manner that it becomes a process of not careless vetting, but careful background checks that will produce a healthy people who will assimilate, honor and accept the norms of whichever state or country they will eventually reside in. All of the organizations that do the vetting are paid money for this service but often do not either have the tools or the background checks to accurately assess an immigrants profile. Thus, the entire system of immigration vetting needs to be revamped and then rebuilt from the ground up, lest the immigrants are not willing to assimilate and follow the rule of law. If not, in the case of America which is already having its own sociological meltdown from those years gone by, will it be steered even farther away from a quite and peaceful habitation and a moral essence that was envisioned by our founders such as Thomas Jefferson, John Adams and Abraham Lincoln? The final choice belongs to the people, not to those politicos and New World Order instigators who have an agenda that has already proven to be horribly dysfunctional and right out disastrous. Cannot the people of America and the biased Mainstream Media see what open borders did in Europe? Must they all hold on to their belief that open borders and sanctuary states and cities are the wave of the future and the best choice for a world that is becoming more chaotic everyday? Where is the hard evidence that this insane and recent immigration agenda worked since being orchestrated by the Obama administration? It’s not working and a person would have to be blind not to see it. However, it is not the blind people who are leading the agenda, while there are the sheep who are being misled under the spell of a socialistic, Marxist movement meant to destroy a nation from the inside out and then rebuild it according to someone’s draconian-Utopian dream. To follow such a model would be the complete loss of freedom which would follow. Both candidates have acted inappropriately and both have history. Private sector history and public sector history are different. Trump’s alleged history has had no impact on the nation and the world. Clinton has three decades of public service with little to show America what has been accomplished for America and Americans. Essentially the government no longer represents the American taxpayers. Is the status quo what America needs or wants? 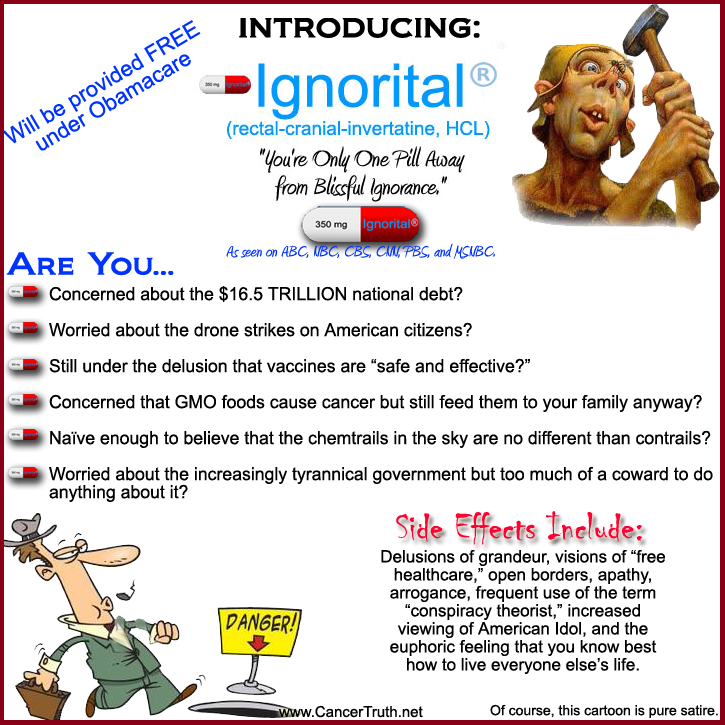 Ignorital: The new drug for what ails ya! This ad is from our good friends over at www.cancertruth.net While even the folks at CT admit the ad is pure satire……..it is a point well made! Thanks Cancer Truth! MEXICAN FLAG BURNER SENDS URGENT PLEA: AMERICA, PLEASE HELP ME! For more than two years Roy Warden, aka “The Notorious Mexican Flag Burner,” has stood directly in the line of fire and worked tirelessly to investigate, expose and hold accountable Pima County Legal Defender Isabel Garcia and the other Pima County Officials who are most responsible for keeping the border open and keeping the flood of Mexican Illegals coming. That’s right: The Illegal Mexican Aliens who are committing crimes in your neighborhood probably came through Pima County Arizona with the blessings and assistance of Pima County politicians. For more than two years Roy Warden has been working to protect America. Now Warden urgently needs your help! “Even though my rallies were lawful, they arrested me 11 times, prosecuted me four times and now I await my fifth trial—all because I stood on the public square and denounced Isabel Garcia and Pima County Open Border Policy,” says Warden. “For the last month my ISP account has been shut down due to non payment. The local press has ruined my professional reputation as a Certified Legal Document Preparer. Now my family faces foreclosure on our home. “I urgently need donations or employment NOW. Please click on the hotlink at the end of this paragraph, read the lead story on my website, and find out what’s going on in Tucson Arizona, the Gateway to America.